Timo Thonhauser, associate professor of physics, believes awareness is an important first step in getting people to accept new technology. That is why the condensed matter theorist chose to work with SciWorks science center in Winston-Salem to develop an interactive mobile exhibit directed at children to demonstrate the use of alternative fuels, especially hydrogen. 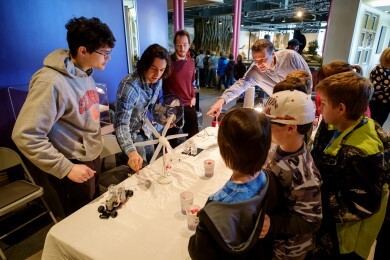 On Friday, Thonhauser unveiled the alternative energy cart to a group of several hundred visiting second, third and visiting fourth graders to help explain problems with current fossil fuels and possible solutions using hydrogen as an alternative. Using a model hydrogen fuel cell car, students could separate water into hydrogen and oxygen and see how the emitted gas powered the car across the floor. Thonhauser leaves in early December to teach in Vienna for a semester but will man the mobile exhibit a few times before turning duties over to post-doctoral student Sebastian Zuluaga and graduate students Evan Welchman, Calvin Arter and David Harrison. Research students (l-r) David Harrison, Sebastian Zuluaga and Evan Welchman, who work with physics professor Timo Thonhauser, assist with an exhibit at SciWorks science museum. 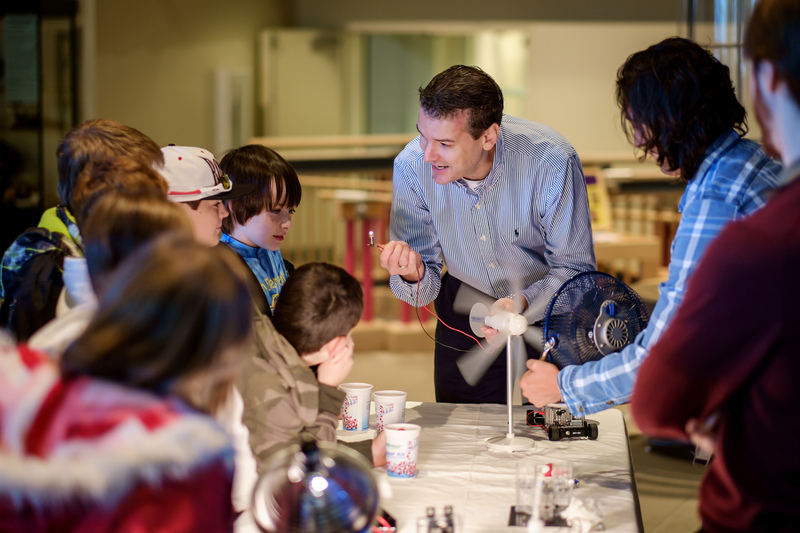 Adam Wilson, exhibits and facilities manager at SciWorks, said the alternative energy cart allows for great hands-on learning for visitors, both young and old. This outreach project is part of Thonhauser’s 2012 National Science Foundation CAREER Award, given to a select few junior faculty nationwide who excel as teacher-scholars. He also recently spoke at a SciWorks Science Café, a series of free, informal talks that highlight the research of regional scientists, tailored for the general public. It is a timely concept – Toyota announced this week it will start selling its first mass-market, hydrogen powered car in December. Thonhauser said the announcement is an indicator of why educating the general public about alternative fuels is so important.